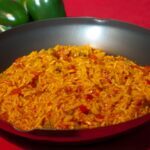 This is a very easy to prepare dish. It’s really versatile, adding colour, taste and nutrition to any plate-perfect to put a zing back in your step on a grey Autumn day! Red, green and yellow peppers are roasted in olive oil with black olives and cherry tomatoes. It can be eaten hot or cold and goes with just about everything. Try it you’ll see! 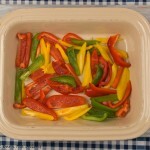 Wash and slice peppers into thin strips, remove pips and place in an oven proof dish. 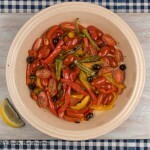 Toss peppers in 2 tablespoons olive oil and bake in hot oven until the peppers soften and skins start to brown lightly. Add a little more olive oil*, seasoning and mix together. Cook for about another 8 minutes or until all the vegetables are soft. 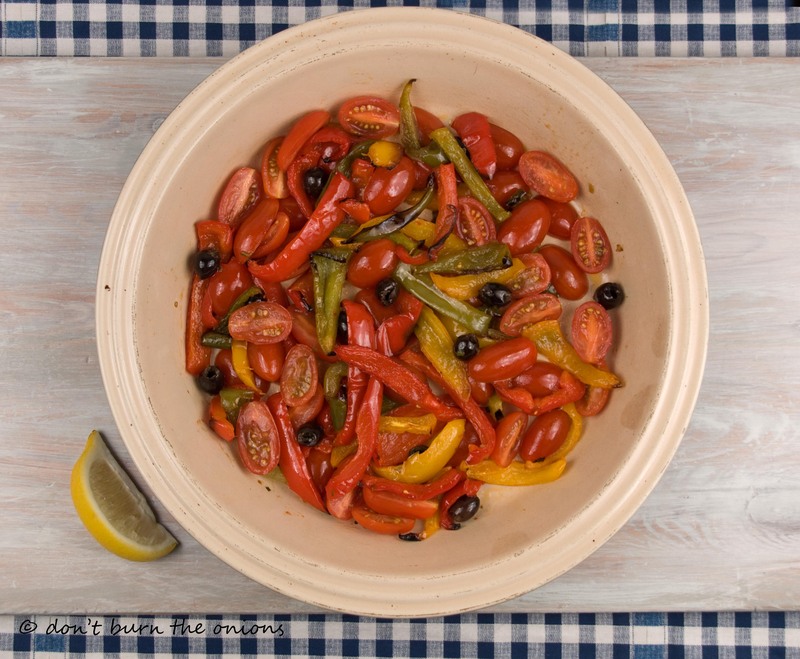 Don’t worry if peppers char a little-they will taste better! Fish or chicken: for recipe ideas click on Paprika Salmon or Sesame Seed Chicken. Eggs: pop some of the cooked pepper mixture into a small earthenware or ovenproof dish and break one or two eggs on top. Pop the lot in the oven and cook for a few minutes, until the eggs are cooked but still runny. Cheese: toss in cubed feta and add to cooked spelt or couscous. Or add mozzarella cheese on top and return to oven until the cheese has melted. Or as an antipasto: also delicious eaten cold with a little balsamic vinegar. Top tip: Olives bought from the deli counter are generally better quality than those sold in jars or tins. 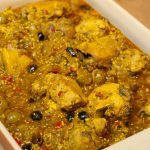 You can use the oil (which is normally infused with herbs and spices) for cooking as it will add a better mix of flavours. For this dish I used the oil from the couchillo olives as it had chilli, garlic and citrus peel. Did you know: that all bell peppers start off green and turn to orange, red and yellow as they ripen ? Coloured peppers are therefore sweeter than the green ones. 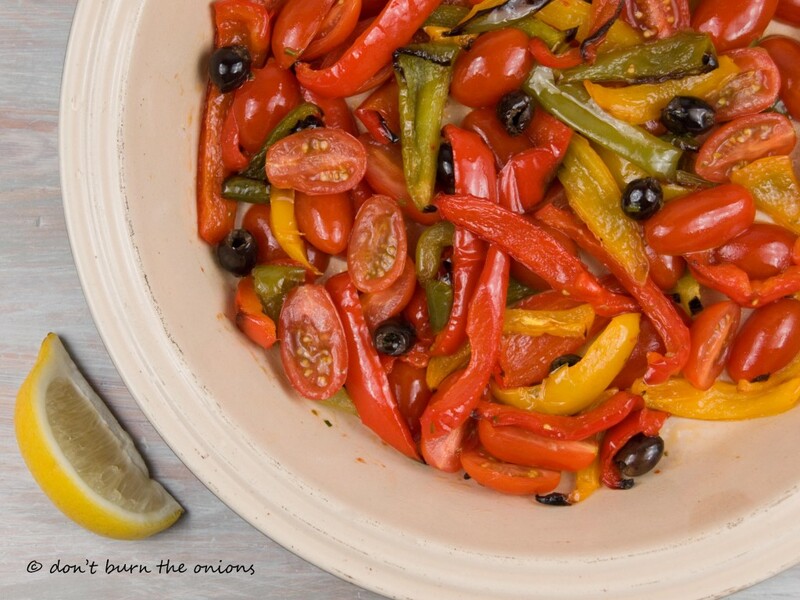 Peppers are currently in season and are high in Beta-carotene (Pro vitamin A) and Vitamin C just what you need to help ward off colds at this time of year! 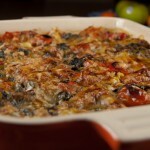 This entry was posted in Meals in minutes, Vegetarian by dontburntheonions. Bookmark the permalink.